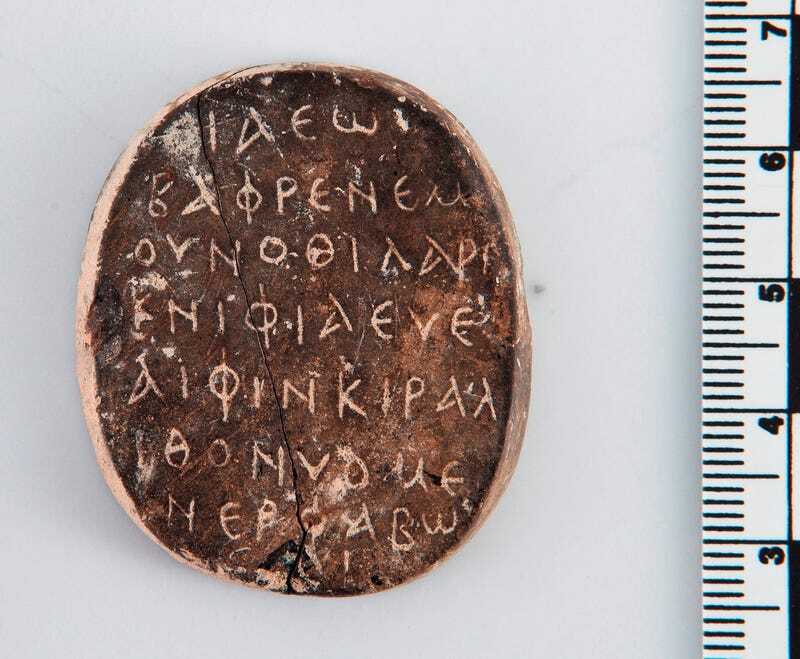 Archaeologists working in Cyprus have discovered a 1,500-year-old amulet with a 59-letter inscription that reads the same backwards as it does forwards. Researchers have found similar palindromes elsewhere in the ancient world writes Joachim Śliwa, a professor at the Institute of Archaeology at Jagiellonian University in Kraków, Poland, in an article recently published in the journal Studies in Ancient Art and Civilization. Śliwa notes that the scribe made two small mistakes when writing this palindrome, in two instances writing a "ρ" instead of "v."
The amulet was discovered in the summer of 2011 by archaeologists with the Paphos Agora Project. Led by Jagiellonian University professor Ewdoksia Papuci-Wladyka, this team is excavating an ancient agora at Nea Paphos, and uncovered this amulet during their work. Agoras served as gathering places in the ancient world. Amulets like the one found at Nea Paphos were made to protect their owners from danger and harm, Papuci-Wladyka told Live Science in an email.